This Califone Oversized Keys Wired Keyboard will help build early confidence and create opportunities for success with special needs students. 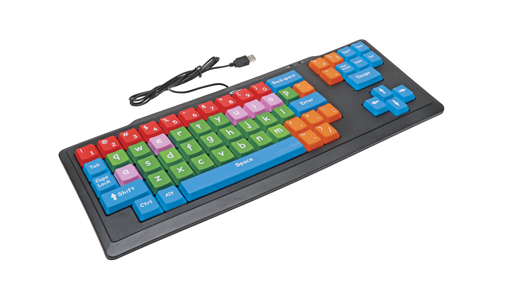 The extra large color coded keys help familiarize with QWERTYstyle layout. Simplified keyboard doesn’t have all punctuation & special characters, yet is an ideal solution for early learners and those with very basic keyboard needs or abilities. The KB2 disables a USB-equipped tablet’s on-screen virtual keyboard, enabling students to see the entire display, meeting a key PARCC and Smarter Balanced requirement and is also aligned to NCSC, EPPA21 and DLM requirements.